A 1:1 mirror your entire database pool (or a selection of your choice), ensuring you won’t lose anything due to an hardware (or software/OS) crash. A more robust, fail-proof and scalable environment, as long as you’ll connect different web sites/services/apps to each of your DB and install a software or hardware http load balancer to distribute clients between them. 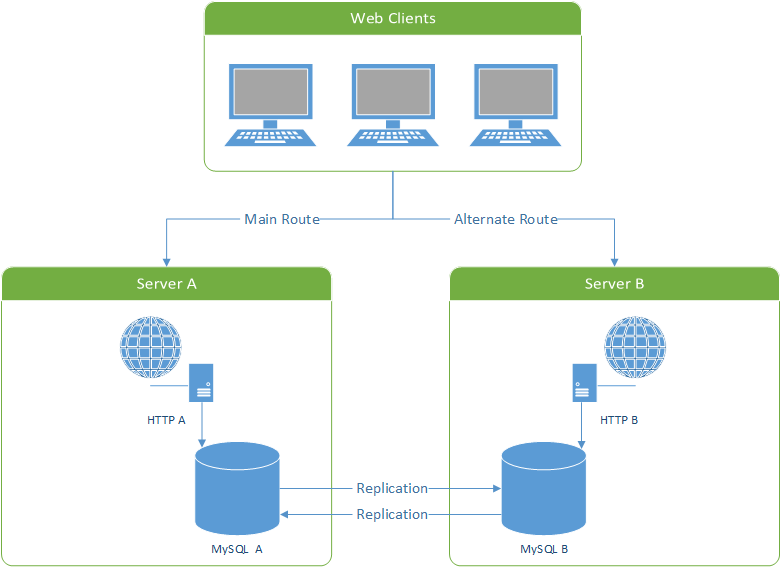 One of the most common scenarios involving Master-Master replication is when you have a 2 VPS (or hosting servers) environment/farm, each one providing an http web server (such as IIS or Apache) containing one or more web sites connected to a local MySQL server instance on the same machine. Once you put up a Master-Master replication mechanism between the two MySQL instances you’ll basically have setup a real-time web mirror, which you can use as a disaster recovery (see picture below), and/or a 2-nodes web cluster managed by an hardware load-balancer responding to a third IP – or any other balancing technique you might want to adopt. In order to setup a MySQL Master-Master replication you’ll need two different Server system instances (VPS, Hosting, virtualized instances… anything will do), each one responding to a specific IP address: they don’t need to be identical, as long as they can both properly run the same version of MySQL Server (v5.1 or above is strongly suggested). We’ll be calling them Server A and Server B from now on. The first thing you need to do is to install MySQL on Server A and Server B. If you already have a MySQL instance up and running on one of them, just upgrade it to the latest version you feel confident to use and then install that same identical version to the other one. As you can see the cfg is almost identical, except for the server-id and auto-increment-offsets values. Please notice that this configuration will replicate/mirror each and every db with the sole exception of test and information_schema. You might also want to keep out other databases such as mysql or other ones: if that’s the case, just add those you want to exclude by adding a binlog-ignore-db and replicate-ignore-db command for each one of them. IMPORTANT NOTE: replicating the mysql database seems to be a bad idea for Debian-based system: check this comment for details. If you’re unsure about doing that, you might just choose to exclude that: the only thing you’ll be missing would be syncing your users automatically, which isn’t critical as long as you don’t do that frequently. It’s also worth mentioning that you can also use an opt-in logic instead of the opt-out we’ve used here: just delete each and every binlog-ignore-db and replicate-ignore-db replacing them with binlog-add-db and replicate-add-db instead, specifying only the database you need/want to mirror. Once you did that, you can stop the servers and restart them. Replace [root_password] with your MySQL root user password and [replicator_password] with any password of your choice: you’ll need to use that later on (see Step 4.5). Fullfill this step for Server A and Server B: you can either use the same replicator password for both servers or pick a different one for Server A and Server B, as long as you’ll use the right one during Step 4 and Step 5 ahead. Or the ultra-neat Copy Database to different Host/Database function featured by the excellent Webyog’s SQLyog, which is also one of the most spectacular MySQL GUI ever made: if you aren’t using it already, I strongly suggest you to download and install the Community Edition (multi-platform and open-source) from its official GitHub repo: you’ll hardly regret that. You’re going to use the File and Position column values in a few. Replace Server A IP Address with Server A numerical IPv4 address, [replicator_password] with the password you choose for your replicator user during Step 2, mysql-bin.000001 and 107 with the File and Position column values retrieved above. Replace Server B IP Address with Server B numerical IPv4 address, replicator_password with the password you choose for your replicator user, mysql-bin.000001 and 107 with the File and Position column values retrieved above. 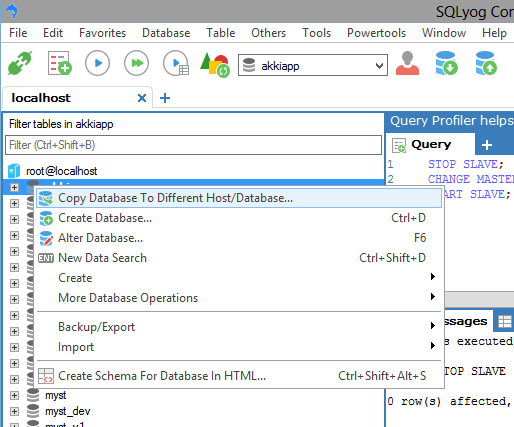 create a new database using your favorite tool (or via MySQL console) on Server A, then connect to Server B to see if it’s also there. create a new user on Server B, then connect to Server A to see if it’s also there. issue some insert, delete and/or update query commands from Server A, and check that the same data will be inserted, deleted and/or modified also in Server B. Notice that the first two tests will work only if you chose to replicate the mysql database (see Step 1): if you chose to exclude it, or to adopt the opt-in method, you’ll need to create/delete the databases and sync the users manually. UPDATE: If the Replication breaks, loses its sync or stops working, I strongly suggest you to take a look at this other post to fix it and/or to put up some countermeasures to prevent it from happening again. IT Project Manager, Web Interface Architect and Lead Developer for many high-traffic web sites & services hosted in Italy and Europe. Since 2010 it's also a lead designer for many App and games for Android, iOS and Windows Phone mobile devices for a number of italian companies. Microsoft MVP for Development Technologies since 2018. Hey fella, thanks for the HowTo. I was stucked for five days hardworking in my Java codes to synchronize data between my server and clients (small-local business) when I suddenly realized that I was doing a completely useless job.. The clients needs an almost instant sync with the servers cause they are kind of a time-critical, ATM-like machine… it was obvious that MySQL would provide replication capabilities. Coundt find a better tutorial than yours though. Your tips were great. Thanks a lot! Glad I could help: keep up the good work! What if two queries insert data at the same time in the same database and table, one on server a and the other on server b? Then you have two different entries with the same id. This way you can prevent this from happening. or do newer versions of mysql take care of something like this automatically? You’re absolutely right: I’m not running the INSERT commands in both the DBs simultaneously (DR-BC setup), so I forgot to add the offsets. I’ve updated the post accordingly and also mentioned your comment in the post. Thank you for making it better. no problem. thanks for the great article! Love the article and it’s the clearest one I have found for a total noob at advanced mysql. I have one question. The set up I need replication for would necessitate one mysql instance being offline for a few hours each day due to my use of mysql for broadcasting web radio. Sever A being on a machine that is on 24/7 and server B being on a normal use machine. Would this affect the opperation of the master master or would it be able to catch up? 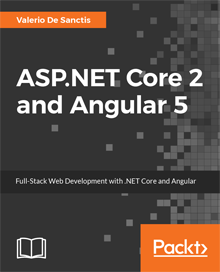 Learn how to build Single-Page Applications using the brand-new ASP.NET Core Stack and the most advanced client-side framework ever! Promo Code: ASPCA50 - 50% off!